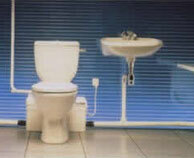 For addition of toilet and other fixtures without breaking concrete floors. Mounts free-standing on any level surface, or can be built-in, concealing the piping and tank. Either floor mounted or recessed flush with floor. 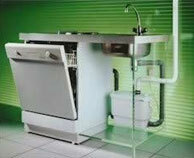 Now with the Qwik Jon, water and sewage waste can go uphill, which means you can install a bathroom almost anywhere! The Qwik Jon pumps in any direction, is very quiet, and is leak-proof and odorless. Tank and all piping can be hidden. The Qwik Jon can be installed free-standing on any solid level surface, or the tank and all piping can be hidden behind a wall and under a 2" x 6" subfloor. No one need ever know it's there. The Qwik Jon is tough, sturdy and designed to be built in. Qwik Jon tank, lid & gasket. Floor Flange Extender Kit with wax rings. Qwik Jon fittings and hardware. $49.95 Click here to order! 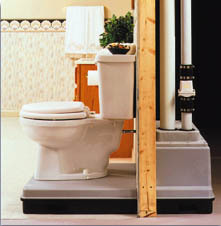 The Saniplus is a system that is used to install a complete bathroom up to 12 feet below the sewer line, or even up to 150 feet away from a soil stack. The Sanivite is a gray water pump and is ideally suitable for use in a basement apartment. It will pump waste water away from a variety of sources, such as a kitchen sink, laundry sink, clothes washer (indirect via a laundry tub only), dishwasher, bar sink, etc., etc. ©Copyright 1992-2014 LOVE Plumbing & Remodel. ALL RIGHTS RESERVED. Terry Love.